An Educational True Story About The Famous Lobstick Family Of Whooping Cranes. 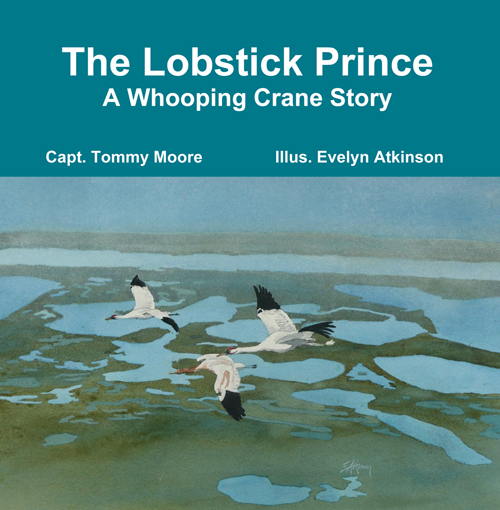 The Lobstick Prince is the educational true story of a very special Whooping Crane that migrates from Wood Buffalo National Park in Western Canada to the Aransas National Wildlife Refuge in South Texas. The true story begins when his father is born in 1978 and continues today. The endangered Whooping Cranes have made an outstanding comeback since there were only 15 of the magnificent birds remaining in 1941. Today while their numbers are up, they face adversity from habitat loss and most importantly the availability of fresh water from the Guadalupe River in Texas. The coastal ecosystems of the Texas Coastal bend evolved with the natural flows of the Guadalupe and San Antonio Rivers, development in this single water source threatens the very existence of the ecologically important species. The Whooping Crane is the proverbial "canary in a coal mine" for the Aransas Refuge. It's primary food is the Blue Crab. When fresh water inflows are reduced, or worse eliminated, the Blue Crabs' number decline. In the 2008-2009 season just over 8 percent of the flock were lost to causes directly connected to the drought. A portion of the proceeds from the sale of this book go to organizations fighting to ensure that the Guadalupe River will continue to supply the life sustaining waters that all of the wildlife in the Aransas area need.